CHARLOTTE AMALIE — Aurio Correa entered the St. Thomas hospital last August to prepare for knee surgery. The 89-year-old St. Thomian had Alzheimer’s disease and dementia but was otherwise in good health for his age, according to his daughter, Luz Correa Chesterfield. 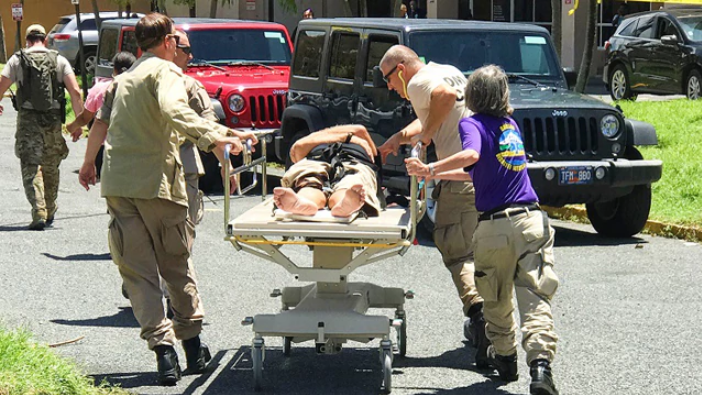 Before he could have the surgery at Schneider Regional Medical Center, Hurricane Irma struck the Virgin Islands in the early hours of Sept. 6. The Category 5 hurricane ripped through the territory with winds reaching 185 miles per hour. The islands’ emergency plan was for patients and vulnerable people like Correa to shelter in place when the hurricane made landfall. But the storm badly damaged the two hospitals on the islands. “We had no idea the type of devastation that was going to occur to our hospitals and other clinical facilities,” Virgin Islands Health Commissioner Michelle Davis says. With its healthcare system crippled, the Virgin Islands government, along with federal relief agencies, decided to move patients. Correa was flown to nearby Puerto Rico. Less than two weeks later, with Hurricane Maria approaching, some of the medical evacuees were moved again, this time to the U.S. mainland. Eva Davis, a 61-year-old from St. Croix, was airlifted to Atlanta in November. Davis (no relation to the health commissioner) was showing signs of rejecting a kidney transplant she had received years earlier and couldn’t get the treatment she needed on the island. After spending a week at a hospital in Atlanta, she now lives in a hotel paid for by the U.S. government. Next month, she plans to leave the hotel and stay with family in North Carolina. As with other medical evacuees waiting to return home, her house is still damaged from the storms, and there are few affordable places available to rent on the island. A Kaiser Family Foundation report six months after the storms found that many healthcare providers were migrating off the islands, and more than 170 employees had left Schneider Regional Medical Center (SRMC). Many private providers have closed, according to the KFF report. This year’s hurricane season started on Friday, though the strongest storms tend to hit the Caribbean in late summer and fall. Rivera-O’Reilly said some evacuees have also been forced to go back to the islands even though their homes are damaged. Gov. Kenneth Mapp has said each hospital will probably need to be torn down and rebuilt, though a Federal Emergency Management Agency (FEMA) spokesperson said in an email that the agency is still working with the USVI government to “determine the best course of action.” Portable hospital units and dialysis trailers were supposed to be ready before hurricane season. The temporary facilities, which could help avoid off-island evacuations and allow more patients to come home, are now more likely to be ready by late summer or fall, according to Davis. “Basically, our entire public health and health care system was devastated, and the length of time it has taken us to acquire our temporary facilities was much longer than anticipated,” she says. As for Aurio Correa, his daughter said at a Senate hearing on medical evacuees in April that her father “was treated like an animal” when he was sent to Puerto Rico. When she visited her dad, his body was covered in bed sores and his own feces. He was still wearing the same red shirt her family dressed him in days before. A few months later, he passed away. “Up to this day, they can’t tell us exactly when my dad died,” she said. She begged lawmakers and health and hospital officials at the hearing to do better. Jfl would have all their trailers up and functioning if it were not for Vera Falu who deliberately sabotaged the procurement process for the trailers.This woman was the chair person for the board even though she had ZERO hospital administration experience. It was not Vera Falu. No one places portable dialysis trailers BEFORE a storm because they take one month to move, and you would have to know one month in advance that you are going to have storm damage. This article was written without any facts as regards trailers or the procurement process. How did Vera Falu allegedly sabotage the procurement process as a board member when it is hospital administrations that are responsible for procurement? Vera Falu is not an angel, but you cannot pin this one on her. Also, why would the Health Department have dialysis trailers when Health doesn’t do dialysis. This article is bogus.